Well, here it is the end of January already, and I am just getting to posting the last two blocks of the Behemoth month #2 blocks. We’ll just call the monthly 20″ by 20″ squares ‘superblocks’ so you can more easily follow what I’m doing. It’s got four half-square triangles (at the corners), one plain square, and four strippy squares. The strippy squares are compound pieces, which have been cut from two strips sewn together first (a light and a dark). Of course you have to do the funky seam allowance math, so for instance if the strippy square finishes at 2 inches square, then the strips you need to cut to sew together to begin with need to be 1 inch finished plus 1/2 inch each for seam allowance of 1/4 inch on each side. So for a strippy square of 2.5″ (the finished 2″ plus the 1/2 inch seam allowance), you need to begin with two 1.5″ strips. Then sew those together along the long edge, press toward the dark side, and then cut 2.5″ squares. And yes, there are pictures of this in the photostream, just click on any picture to go to the picture set for that block. The cool thing is with these pieces you can easily change your mind about which way you want the Churn Dash to be, dark on light, or light on dark. By switching the direction of the half-square triangles, and then also the strippy squares, you can flip the pattern to be dark. Of course then you need to change out the solid square to a light color instead, but if you have lots of strips and squares on hand, this is easy and just becomes a matter of a design choice. The leftover center dark square is to the left — all the other components are the same. All I did was reverse the direction that they point. So try this with your block as you assemble it. Put it together one way, and then try reversing it and the center square. See which image you like better, light on dark, or dark on light. Figure out which one pleases you more with your other blocks. 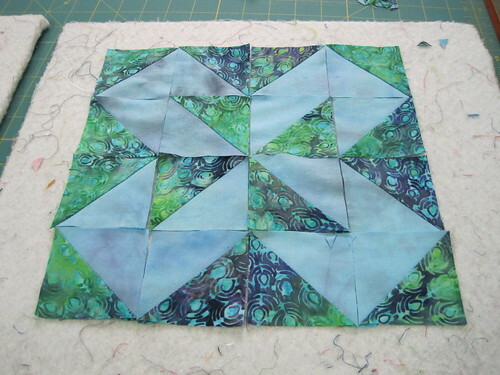 Or just make two blocks, you’ll certainly use the spare later if you’re making the bigger quilt. Which reminds me, if I haven’t said it before, definitely build up a spare parts bucket with this quilt. Anytime you make half-square triangles, make a few extra. Same with flying geese. That way you can fill in a plain strip or square with your spare parts and look like a piecing genius who’s drafting all sorts of new patterns. In superblock #2 there’s also a little strip of flying geese and the Colorado block. You already know how to make flying geese, and the Colorado block is made up entirely of half-square triangles, which you also know how to make (or can choose your favorite method). You can do all 16 in the same lights and darks in your half-square triangles for this block, or experiment a little with different combinations of colors in different locations. Or do it completely scrappy, just keep the light and dark locations correct in each position, and you’ll still see the pattern. If you need a review on how to do flying geese, just click on the picture below. So there’s everything you need for superblock #2; good luck! Be sure to send in a picture of your Behemoth in progress if you’re not here on an open sewing night (where we try to take lots of pictures — the blocks look very different with different color choices). Be sure to check the Block of the Month sewing dates page to check for those dates if you’re not sure. If it’s quiet here for awhile it just means there’s LOTS of stuff going on in the studio, not all of which I’ve uploaded the pictures for :). Just give a call or e-mail to find out what’s happening! It’s from the second Behemoth large block, the one we were working on in November (you’re with me, right??? ), but that I still haven’t posted all the components to yet. (There’s a few more to come.) Okay, so maybe block #3 will be in February, but that’s good, right? It gives everyone a chance to catch up. Besides. the first few blocks are the most time consuming to show and explain, and the more experience you get, the easier the later blocks become. That’s my story and I’m sticking to it :). 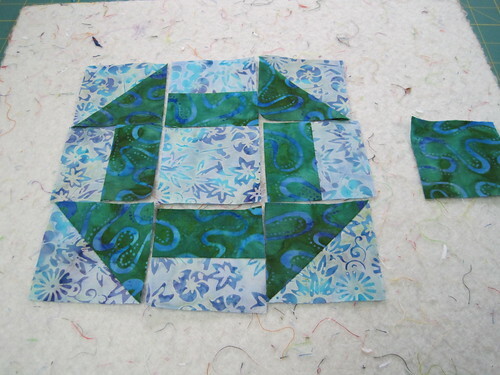 This is a pretty good place to start if you haven’t done paper piecing before. Let me clarify. The technique you will use on this block component is actually called paper foundation piecing. There is another technique called English paper piecing, which is very different, that we’re not going to cover in the Behemoth. If you click on the picture above you’ll get to the photostream that has the entire process documented so if you haven’t done paper foundation piecing yet (or haven’t made friends with it) then you might want to check out each individual step. You need a dark, a medium, and a light, and I started with 2.5″ strips and then trimmed them to fit the paper. That’s quick and easy for me but it does waste a bit of fabric so if that keeps you up late at night then you might start with pieces cut closer to their finished sizes. Foundation piecing can be out of fabric, stabilizer, or paper, and can be left in (depending on the type) or removed after piecing, depending on what you’re after. A foundation provides perfect seam line guidance for very spiky points, which are difficult to piece with other methods due to sewing distortion. Also a foundation provides strength and stability for slippery or biased fabrics (like silk ties) so depending on the circumstance you may wish to leave the foundation in the quilt. Paper foundation piecing isn’t really scary at all but many quilters shy away from it because it is a bit of a perspective shift. Typically you’re looking down at the seam you’re sewing from the top side of the work. With foundation piecing you’re looking at the seam from the bottom — that is, you’re sewing with the wrong side of the quilt top facing you. Clear as mud? Well you can think of it like a compass issue. In the West we look at our compasses top down, as if they were by our feet. The Chinese look at their compasses as if they were in the sky, looking up at them (by the way, this reverses north and south without altering east and west — how’s that for a brain flip). 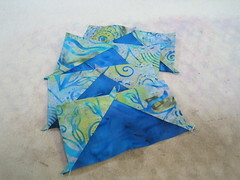 So just think of paper foundation piecing as looking up through your quilt top toward the sky. The printed guidelines on the paper or other foundation will be flipped from how it appears on the right side of the quilt. So give it a try and make your own beautiful eight pointed star!